Hampton Roads Publishing, 9781571747938, 256pp. This is a book about ordinary people--plumbers, artists and accountants, bakers and beauticians, teachers and lawyers--who have been able to receive communication from loved ones who have died. Included here are accounts from over 80 people across the country who have had contact with the dead through the diaphanous veil that separates them from the living. The book begins with the story of Annie's deceased daughter speaking to her in the early morning hours. The communication was so transformative that she began to share her experience. Much to her surprise, she discovered that after-death communication is much more common than is normally assumed, and she began to connect with other folks across the country who had similar experiences. Each of the ten chapters is organized around a specific kind of after-death communication. 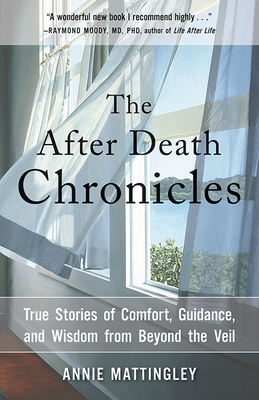 Included here are chapters on dreams, verbatim conversations, and synchronicity through nature and various other physical manifestations, descriptions of the results of these occurrences, and advice on how to open up to after-death communication. This book inspires in the reader reassurance, courage, healing, and a sense of wonder. From the author: "The time is ripe for people to recognize the blessing of how frequently our dead beloveds return . . . to confirm the reality that consciousness continues beyond the grave and to remind us that there is much more to death than the physical cessation of breath and pulse. It is time to break the silence, time to stop keeping these powerful healing experiences to ourselves. It is time to allow the experiences themselves, and the positive effect they have on the living." Annie Mattingley has an MA in consciousness studies and has worked as a teacher, magazine publisher, and hospice volunteer. She is now retired and lives in Questa, NM. Visit her at www.anniemattingley.com.